You will normally receive your order within 7-10 business days. There are certain times of the year, especially during November and December, where there may be slight delays. Please review the FedEx.com website for further information on any delays they may be experiencing. MSCEES is not responsible for any FedEx shipping delays. Your items will be delivered in 2 business days (1 day to process your order + 1 day shipping). This option is only available for PO BOX, APO, AK, HI, AA, AE, AS, AP, FM, GU, MH, MP, PR, PW & VI. If we experience higher order volume, there may be delays in shipment. Orders are shipped on business days only. Business days are Monday-Friday, excluding federal holidays within the United States. You may also choose to upgrade the shipping method for faster delivery (additional charges apply. See table above for details). Delivery times for FedEx 2Day and Standard Overnight shipping are based on the day we download the order. Please make sure to allow for this extra day when placing your order (see above table for details). Burtsbees.com is only able to ship to one shipping address per order. If you'd like to ship to multiple addresses, please place separate orders for each unique address. 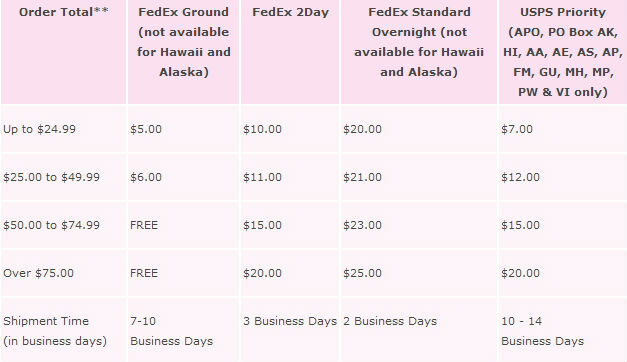 FedEx Ground and FedEx Standard Overnight are not available. FedEx 2Day or USPS Priority must be selected. Most items may be shipped to a P.O. Box or Military APO/FPO addresses, but some restrictions apply. Orders being sent to P.O. Boxes or Military APO/FPO addresses must be shipped via the United States Postal Service Priority (USPS) shipping method. FedEx Ground, 2Day and Overnight shipping are not available. We are sorry, but products purchased on msceeskincare.com & mscee.com can only be billed or shipped to destinations within the United States. All packages sent via FedEx will have a tracking number assigned and a tracking email will be sent once shipped. For questions, our Consumer Care hot line and email is available Monday - Friday 10 AM - 4:30 PM EST. MSCEEs is not liable for any lost shipments when USPS is selected as the shipping method. The consumer is responsible for claiming all misplaced, lost or undelivered shipments directly with USPS.